Great expedited service. Needed delivery by Sunday, received by Thusday. Very nice shopping experience. It's obvious the Historical Emporium stores put care into every corner of the biz, from the website, right down to the delivery time. The ascot I purchased was beautiful and seems of high quality. I've ordered similar items recently from other vendors and it's been hit-and-miss--particularly those ship from outside the states. It was a pleasurable experience shopping at Historical Emporium. I found w hat I was looking for at a reasonable price. I would shop here again. My daughter used the boots and skirt that I bought her as part of a maid-of-honor outfit for a friend's wedding. The outfit was beautiful, fit well, was reasonably priced, was comfortable, and contributed to the ambience of the occasion. My daughter was greatly pleased overall. Sometimes going back in time reminds one better quality was a hallmark. W hat a wonderful breath of fresh air to do so and walk away with a simply spectacular bit of clothing. Ordered the first product, it arrived very fast and was very good quality but wasn't happy with it, as happens sometimes with Internet purchases. Return process was fast and easy. Ordered replacement (different) product, which arrived just as fast and was perfect. Have already recommended GentlemansEmporium.com to others and I will definitely shop here again. i bought a gun holster and belt from them when i received the item i was just amazed how great the product was. well made no time getting product. the people who helped me out were very good at what they do. i would recommend this company to everyone. shop here save money. thanks david richard. The blouse is perfect! Fits as described and the detail is lovely. At the last minute I decided on a size change and requested it via email. The change was easily made which saved me a lot of grief in returning the product. I've ordered a number of items over the past few years to be used as costumes in plays. I've never had a complaint with the products I've received, the quick shipping or the customer service. I even get speak to a person when I call. Thanks a million for making my actors look so good! This is a very good site. I have ordered twice from them. They have a fairly limited inventory, but, w hat they do have is of very good quality. I've never had to contact customer service because both orders arrived quickly, were as advertised, weren't damaged, and were exactly w hat I ordered. Great product selection. Great options on those selections. Wonderful prices. Customer friendly website and ordering forms. Fast, fast, fast delivery! I've purchased everything from accessories to clothing from gentlemansemporium.com and have not been disappointed. The quality of the items are first rate as well as the attention to detail and authentic replication of the period. Delivery was quick and the fez was exactly w hat we wanted. It is a quality product. I have purchased several coats,vests,and shirts from western emporium and have been very satisfied with the shopping experience.had an issue with one shirt and the customer service folks rectified in good time.unlike most custmers I wear the clothes that I purchse regularly not as costumes.I have always liked frock and the styles of the 19th century american west by far more than the cookie cutter styles of today.anyway I'm thankful I found a place where I can purchase clothes that I like and quality that works for me.I can afford some but I always appreciate a sale.Thanks and I'm glad you're there. I had planned to make my 1890's day dress, and ordered my hat immediately. When I encountered issues with the bodice and was running out of time, I ordered a blouse. Of course it was a 3-day holiday weekend, and I needed it before the next weekend. Your customer service was great! When I called on a Tuesday, I was told my order had already been made ready for shipment, and I would have it before the date I needed it. Being between sizes, I asked about my choosing the larger size, and was assured it would be fine. She was right. It was awesome, and I looked great! Thank you so much for coming through for me, and for having such high quality merchandize. Both my blouse and my hat were much admired. Of course I told everyone where to get one for themselves! I won't make a habit of expedited shipping, but you came through for me when I needed it, and I thank you for it. Extremely fast shipping. I was amazed by the quality of the products. Everything fit well, no surprises with the sizes. Excellent shopping experience. I will definitely buy again. Believe it or not, my order was called in on the previous Thursday and I received it the next Wednesday. I bought an original skimmer from eBay and it arrived 6 days later. Both arrived for Tombstone's Territorial Days! Both went over magnificently! 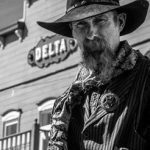 I'm also the photographer for the City of Tombstone, AZ, and this outfit was very well received. I got nothing but compliments! Thgis suit not only looked great, it felt great too! I had a seersucker suit in high school, I loved that seesucker suit too. It has now taken me this long to get another seersucker suit or about 50 years now! Yes I will buy more from you when and where necessary. YTgank you for providing a great product! Items were as advertised easy to order. Absolutely no problems. I found a wonderful "ice cream man" jacket, with red and white vertical stripes. I needed a straw boater hat to go with this wonderful jacket. I found the perfect hat at Historical Emporium. The hat is good quality, and the X-Large fits my 7 5/8 head perfectly. The hat now rests on my Stickley costumer, at my front door, just above my jacket. Everyone who walks through the door comments. Totally pleased with service, price and product. Thank YOU, I'll be back. i will be returning the highrider belt. extremly undersize. not a 38 in waist at all. Exactly as described. Perfect fit. Good quality! I was happy with my order it came quick to my home. I'm completely satisfied with my order. The order arrived within 4 days of purchase & is quite possibly; the best, and most comfortable dress shirt I've ever purchased. 100% satisfied and will definitely order from again. Every part of the transaction went smoothly. You guys rock!! FAst, friendly, excellent products and service! Very happy with the material and quality of the vigilante coat, trousers and waistcoat. The service was fantastic. Even though my original order didn't work out too well. I was able to return, be reimbursed and get the vigilante outfit. Which I will be wearing for my wedding. I placed my order online on a Sunday. Later that night I realized that I had forgotten to include an item in my purchase. I did not want to incur another shipping charge by creating a new online purchase so I called western Emporium Monday morning and explained my dilemma. The original order was ready to ship, but they were able to add my new item and still ship it the same day. I received the entire order, complete and correct just a couple of days later. Bravo! Changing the order at the last minute would have caused many companies to delay the order for a day or two. Not here! Customer Service really is #1! Very nice waistcoat and very good service. The only thing if buying from out side the USA is that you might have to pay customs charges like I had too,but apart from that no problems. Ordered the wrong size western style holster with belt, way too big. Called about returning it for the correct size, got the nicest lady on the phone, very helpful. Returned the product and had the new one in hand in less than a week. Great customer service and excellent product. Thanks folks.